CubaBrief: Upgraded Cuban SIGNIT BASE in Cuba. Havana has sold intercept data from U.S. communications to military adversaries of the U.S. Center calls on Administration to investigate. In view of Havana's record of hostile actions against the United States, including the attempted smuggling of war planes to North Korea during the previous administration, the downing of American small civilian aircraft in international airspace in the Florida Straits, and Fidel Castro's message to the Soviet Union in 1962 urging the use of nuclear weapons against America, this article just published by THE DIPLOMAT should not be ignored. The Center for a Free Cuba calls on the Administration and Congressional Committees on intelligence and foreign affairs to promptly look into this matter. Russian spy ships returned to Havana's harbor while the Obama administration was negotiating with the regime. The difference in size and architecture of the new radome antenna structure compared to the stand-alone parabolic dish installations present over the past ten years at Bejucal indicates a new level of investment in such facilities; the source of this investment is not clear. The governments of both Russia and China have recently signaled their intent to augment military and economic investments in Cuba. In 2014, Russian President Vladimir Putin wrote off approximately 90 percent of the $32 billion Cuba owed on Soviet-era debt. In the same year, a Russian member of parliament stated that Russia would re-establish the sort of collaboration with Cuba it had had at the Lourdes signals intelligence site south of Havana during the Cold War (Lourdes was shut down in 2001). The Russian administration denied this shortly afterward, but in 2016 a senior Russian defense official suggested Russia was considering reopening a military base in Cuba. The Russian signals intelligence ship Viktor Leonov docked at the port of Havana in 2014, 2015, 2017, and most recently in March 2018, following a reconnaissance patrol along the southeast coast of the U.S. that included an excursion within 20 nautical miles of the Kings Bay submarine base in Georgia. In 2017 Russia completed a new satellite communications ground station not far from Cuba, in Nicaragua, purportedly for GPS-type signals, but other uses cannot be ruled out. Cuba’s largest international creditor and trading partner is China, which recently made a $120 million development loan for a container port at Santiago de Cuba. In the past three years, several Chinese companies have announced investments in production and research facilities in Cuba, as well as a proposed $460 million golf course near Havana. These followed a state visit to Cuba by China’s President Xi Jinping in 2014, in which he met with then-president Raúl Castro as well as the ailing Fidel Castro. Chinese Prime Minister Li Keqiang visited in 2016, meeting with both Castro brothers and signing 20 cooperation agreements between the two countries. Reciprocal visits by high-level Cuban and Chinese military leaders took place in 2015-2017. 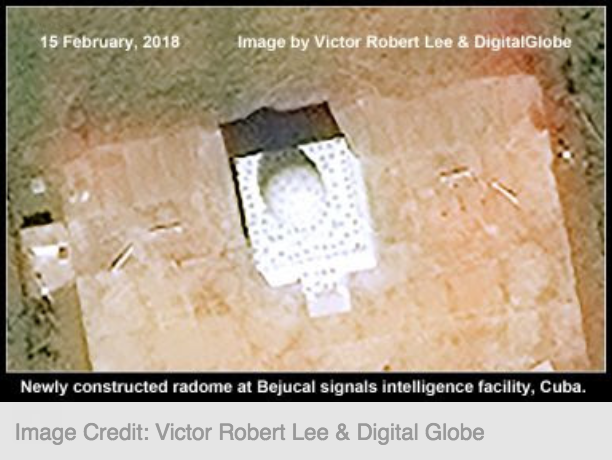 There is scant public evidence that Beijing is behind the new radome at Bejucal, but U.S. Senator Marco Rubio, a member of the Senate’s Committee on Foreign Relations as well as the Select Committee on Intelligence, identified China in 2016 as being active in Cuba-based electronic surveillance of the U.S. by referring publicly to “this Chinese listening station in Bejucal.” As reported in The Diplomat, China has also recently built a space tracking station in Argentina, operated by China’s military, that experts say could have both civilian and military/intelligence purposes, and which has a longitudinal alignment with geosynchronous satellites stationed above the U.S. Eastern Seaboard that control civilian and defense communications. The Cuban government has been reported to sell its intercept data from U.S. communications to third-party buyers, particularly military adversaries of the U.S. Also, in 2003, Persian-language satellite transmissions by Voice of America and the Los Angeles-based Iranian opposition television network NITV were reported to have been blocked by jamming signals originating from Cuba. 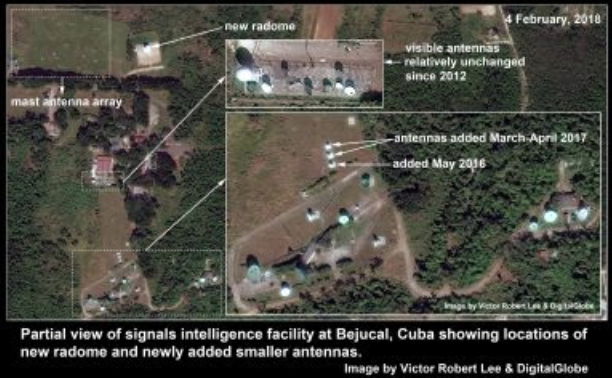 The brand new installation at the Bejucal base suggests augmented capabilities for signals interception and disruption by Cuba, China, Russia, or a combination of these authoritarian governments, via a facility less than 550 kilometers from U.S. Central Command, and ideally situated to intercept signals from geosynchronous satellites servicing the entire Eastern United States.